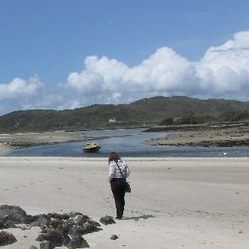 @Laineyfaefife the beaches and campsites at Arisaig are beautiful. Here you will find the beautiful Camusdarach Beach where some scenes from the film Local Hero was made. You will also come across the white sands of Morar nearby. @Laineyfaefife Love jumping into a motorhome and heading North:) It's such an adventure and great for couples too. We had a wonderful time on the Isle of Harris and Lewis in the Outer Hebrides last summer with a Space Campervan. The beaches, blackhouses and seeing the process/skill behind the making of the Harris Tweed is well worth a visit. If you have any questions don't hesitate in getting in touch. Hope you have a wonderful time on Arran.